Part 2: Why Choose OpenPro? 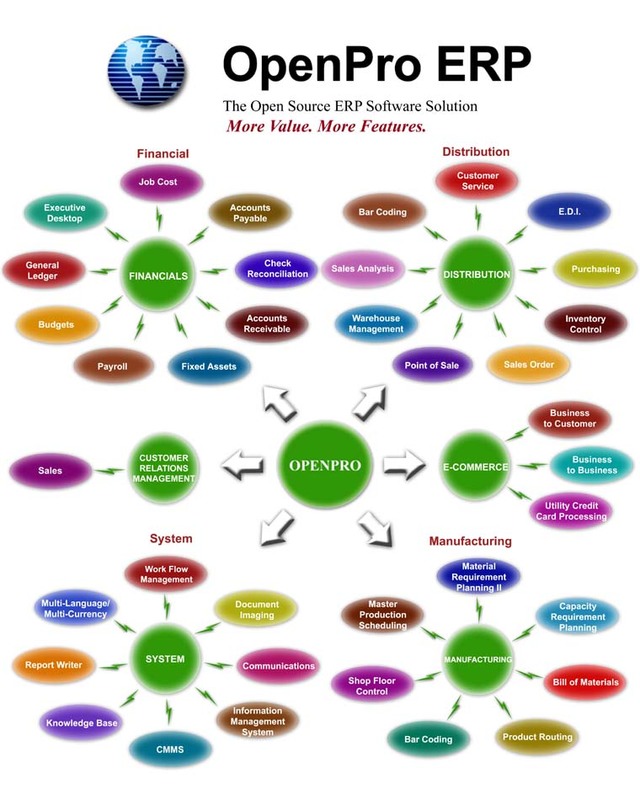 OpenPro offers business software solutions for every company looking for more value and more features from their ERP solutions. OpenPro supports most industries with a complete ERP software solution, showcasing a full suite of applications within six modules: Distribution, Financials, Manufacturing, Customer Relationship Management (CRM), E-commerce and Systems. With its modular design, customers have the flexibility to select the software capabilities that best meet their current needs, with the ability to add to, update and expand their ERP software to accommodate future business demands. OpenPro’s six modules and their individual features. Fun Fact: OpenPro is built using open source LAMP technology; both the initial purchase price and the ongoing maintenance expense can cost half as much as Windows-based ERP software solutions, while offering a broader range of functionality. So, now you know about OpenPro’s modules and their features. Next week we will be posting Part 3, the final post of this blog series, featuring what our customers have to say about us. Look for our announcement on Facebook, LinkedIn, Twitter and Google+. Stay tuned and stay connected! If you would like more information about OpenPro’s ERP software, please email infoop@openpro.com and one of our sales representatives will be happy to answer your questions. Or, feel free to call our customer service department: 714-378-4600. So, what exactly is OpenPro software? The OpenPro system consists of six major solutions, as shown in the image above. For more detailed information about OpenPro software, please visit our website: http://openpro.com/products_modules.html.